Join spirited Peg and her sidekick Cat as they embark on adventures, solve problems together, and learn foundational math concepts and skills. Filled with lively songs and engaging and quirky characters, each whimsical adventure features a REALLY BIG PROBLEM that Peg and Cat must work together to solve without totally freaking out! Solving problems is even more AWESOME when they involve music! 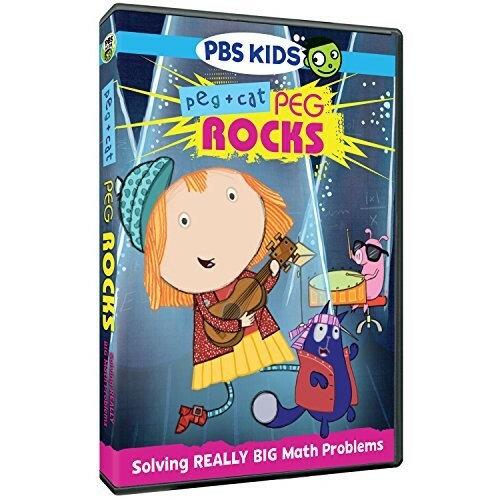 This rocking DVD features 7 stories, including The Big Gig Problem - Peg and Cat need to round up the missing members of their touring band, the Electric Eleven, in time for their big gig performing for 100 chickens and The Mega Mall Problem - Peg and Cat have to search the enormous Mega Mall for the teens so they can all join the Zebra Guy dance contest.